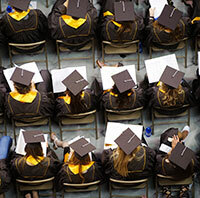 Fall commencement ceremonies at the University of Wyoming will be held Thursday-Saturday, Dec. 11-13. UW is scheduled to accord degrees upon 634 students, including 482 undergraduates; 142 graduate students; nine law students; and one pharmacy student. The largest degree categories are bachelor of science, 184; bachelor of arts, 157; master of science, 60; and bachelor of science in nursing, 47. The multicultural graduation celebration will be at 3:30 p.m. Thursday, Dec. 11, in the Wyoming Union Yellowstone Ballroom. The College of Arts and Sciences program, along with a ceremony for College of Agriculture and Natural Resources graduates, will be held in the Arts and Sciences auditorium Friday, Dec. 12, at 4 p.m. The College of Business will hold its ceremony at 10 a.m. Saturday, Dec. 13, in the Arts and Sciences auditorium. At the same time, the College of Health Sciences program will be held in the Wyoming Union Yellowstone Ballroom.